Welcome to Grey Dog Home Inspections. We believe that a thorough home inspection has the power to put your mind at ease as you make one of the largest investments of your life. This is why we take our responsibility as your chosen home inspector seriously. We are certified by the International Association of Certified Home Inspectors (InterNACHI) and operate in accordance with their Standards of Practice (SOP) and Code of Ethics. We uphold these standards and ideals with integrity so that our customers never have to worry about the quality of service that we provide. Why Choose Us Over Other Home Inspectors? Choosing the right home inspector can seem overwhelming. With your investment on the line and so many inspectors to choose from, how can you be sure that Grey Dog Home Inspections is right for you? From our reporting software to our inspection tools, we are equipped with the latest technology to help us find conditions which will affect your investment. We are certified in Infrared Thermography, a technology which allows us to find moisture intrusion and energy inefficiencies that cannot be seen. As your inspector, we have no financial interest in the home sale other than the fee you pay us to conduct the inspection. Maintaining strong, professional relationships with realtors is important for our ongoing business, but at the end of the day we are loyal to you. You can be assured that we will provide honest information about the condition of the home. Some inspectors rush from one inspection to the next, often missing critical issues. We take the time to ensure you are fully aware of conditions that affect your investment. We’ll discuss these with you and if you wish, we’ll review the report with you before we leave. When looking to buy a home in the Fredericksburg or Stafford area, it is important to choose a local inspector. We understand this area’s unique characteristics and are familiar with building standards and common issues that homeowners should be aware of. We generate our inspection reports using HomeGauge software. If you wish, we can review the report with you on site. Typically, the completed report will be emailed to you on the day of the inspection. Our reports feature well organized and detailed information about the home’s systems and component, as well as any issues we discovered during the inspection. We include photos and videos to help you clearly understand the issues. Our reports also feature an interactive tool called Create Request List (CRL™) which helps you and your realtor summarize issues you want to include in negotiations with the seller. 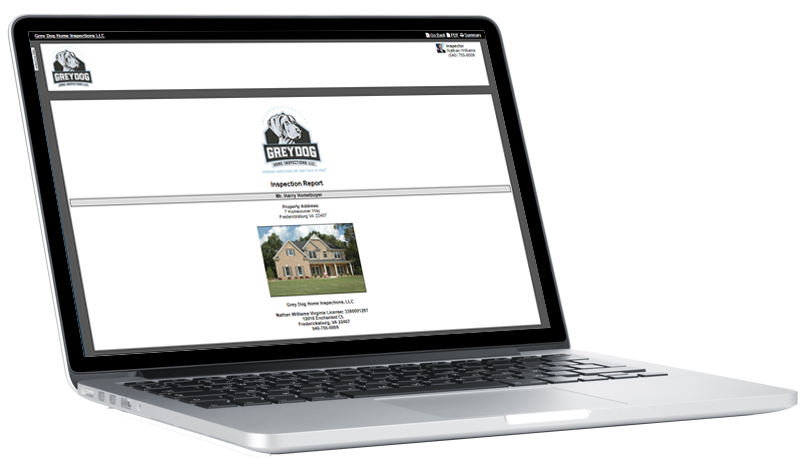 Contact Grey Dog Home Inspections today to schedule a thorough home inspection. Be sure to ask about our discounts for first-responders, active military, and veterans.